Range: Southern China, Myanmar (Burma), Malaysia, Thailand, Laos, Cambodia and Vietnam. Diet: All tigers are carnivorous. Indochinese tiger's prey consists mostly of antelope, wild boar, wild pigs, and a variety of other hooved mammals indigenous to their territory areas. Cubs Per Litter: (Usually 2-3 cubs) Cubs are born blind and weigh 2-3 pounds. 18-26 month intervals. Social Structure: Solitary, except during mating season. Male territory may sometimes overlap. The "Corbetts" name stems from the scientific name of the subspecies, panthera tigris corbetti, which in turn is named in honor of James J. Corbett. Indochinese tiger (Panthera tigris corbetti) is more commonly known as the Corbetts tiger, or Malayan tiger. It was recognised as a separate subspecies in 1968 when Mazak described a tiger from the vicinity of the Central Vietnam coastal town of Nha Trang. These tigers were found to be living across Indochina, eastern Burma and Malaysia. 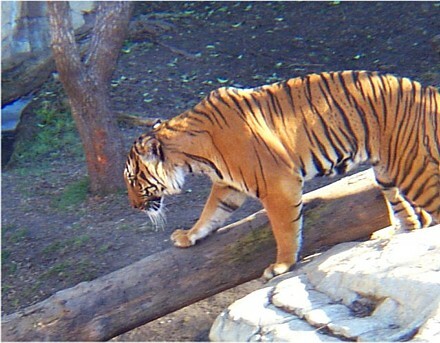 The Indochinese tiger is smaller, darker in coloration, and has narrower stripes less bold stripes than the Bengal tiger. They are presently located across southern China, Laos, Vietnam, Cambodia, Malaysia, Thailand and eastern Myanmar (Burma). Most of their habitat is made up of remote forests with hilly or mountainous terrain. Indochinese tigers live in remote forests in hilly to mountainous terrain, much of which lies along the borders between countries. Access to these areas is often restricted, and biologists have only recently been granted limited permits for field surveys. As a result, relatively little is know about the status of these tigers in the wild. Their main prey species are large animals such as deer, buffalo and wild pigs, but they will also hunt fish, monkeys, birds, reptiles and sometimes even baby elephants. Occasionally, tigers kill leopards, bears and other tigers. Indochinese tigers mate throughout the year, but most frequently between the end of November to early April. After a gestation of 103 days a litter of up to 7 cubs, although averaging 3, is born. Cubs will leave their mothers as young as 18 months old, or as old as 28 months old. During the first year, mortality can be as high as 35%, and of that 73% of the time it is the entire litter that is lost. The main causes of infant mortality are fire, floods, and infanticide, with the latter being the leading cause. Females tend to reproduce around 3 ½ years and males just under 5 years. In captivity, females have produced through age 14. Indochinese tigers are on CITES: Appendix I and are listed as Endangered by the IUCN. They are illegally poached for their fur and other body parts, and suffer from habitat loss. The Indochinese tiger (P.t.amoyensis) is under extreme threat of extinction. According to a new WWF report, an average of one tiger per week is killed in Vietnam, Cambodia, and Laos to supply a lucrative demand for their parts in traditional Chinese medicine. Indochinese tigers, which probably number fewer than 1,500 in the wild, are also hunted in the rest of their range in Thailand, Malaysia, and Burma. WWF recently provided emergency funding for regional training workshops to bring together, for the first time ever, experts from within Indochina and Southeast Asia to address critical tiger conservation needs. According to the report, urgently needed protection measures include status surveys to determine the location and viability of tiger populations; the establishment and strengthening of protected areas; training for park and wildlife officials; cross-border trade controls; and reduction of tiger product consumption in the major consumers of China, South Korea, and Taiwan.